Bike-racks with places on one or two sides, assembled or in kit, use on private areas closed to public transit. Articles of rubber, bollards and wheel stoppers, use on private areas closed to public transit. 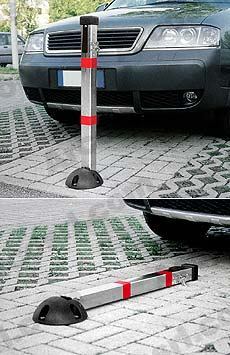 Car barrier (pole) for car space. Frame made of electric-zinc steel tubes. 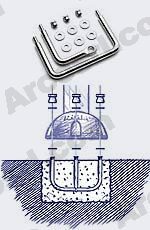 Protection cap, on fixing foot of electric-zinc coated steel, made of POLYAMIDE (NYLON), glass loadedo "FIBER GLASS", very resistant material - new refined design - round shapes. Automatic locking on manual return to the vertical position. Possibility of locking at a lying position as well. 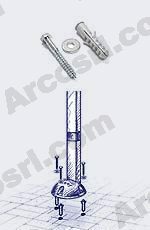 This product has been certified by TÜV. Packing in single cardboard box.